The templates on this page are intended to help investigators construct documents that are as short as possible and written in plain language. The consent form (ICF) templates provided by the IRB comply with federal regulations and HIPAA. There are other webpages devoted to providing guidance for writing readable, compliant ICFs. The IRB has assembled a compendium of procedure descriptions and their associate risks from consent forms. The document can be found on the Standard Language page. To expedite approval of their consent forms, investigative teams should use these examples. The examples should serve as a starting point and should be edited as necessary to match the requirements of the specific study. What if the sponsor or study group has provided a model consent form? Those rewriting model consent forms to fit the CHOP consent form templates often make them worse rather than better. The IRB will accept and approve an ICF that differs from the templates, provided that the document contains all of the required and any applicable optional elements and it is well written. The consent form must include the same required elements as a consent form where another IRB serves as the reviewing IRB (CHOP ICF Requirements). This includes the header should identify CHOP as the site, the CHOP PI (and not an external PI) is listed with their contact information, CHOP's HIPAA language should be used, CHOP's Injury Compensation Language must be used, the CHOP footer must be at the bottom of the ICF so that the eIRB system can stamp the form. Writing a consent form requires substantial effort to take the consent template and add the required information using plain language, brevity and clarity. However, making the effort at the time of the initial submission will greatly speed up the approval of the study. To get your consent form approved quickly, it is incumbent on the investigative staff to create clear, simple consent documents. Edit, revise and edit again - until the document is clear and concise. 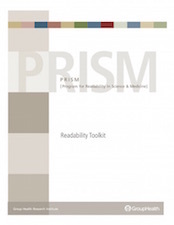 The PRISM Readability Toolkit contains information about the principles of Plain Language and methods and examples for improving readability. The toolkit recommends using the Flesh-Kincaid reading tool included in Microsoft Word. However, the CHOP IRB recommends using the tools available storytoolz.com instead, particularly the SMOG index. Studies have shown that the Flesh-Kincaid can underestimate the difficulty of text related to medical information by 1 - 2 grades. Pictographs that present a graphical representation of the frequency of study risks, such as the meaning of likely, less likely and rare or common, occasional, and rare have been show to improve subject comprehension. Two examples are included below so that they can be incorporated into consent documents. A consent form and a stand-alone HIPAA authorization form. The combined consent/HIPAA authorization has the advantage of requiring a single document and requires a subject's signature on only a single document. The disadvantage is that the consent form is longer and is harder to understand. Using a stand-alone HIPAA Authorization instead of a combined document shortens and simplifies the consent document considerably. There is another advantage to using a stand-alone HIPAA Authorization, the IRB does not review or approve stand-alone HIPAA Authorizations. The responsibility for this form falls on the investigator. There are disadvantages, subjects will need to sign twice - once for the consent form and and once for the HIPAA Authorization - instead of a signing a just one document. In addition, the investigator will need to remember to use both forms instead of just a single form. The consent form templates include a signature page that is appropriate for studies approved under 45 CFR 46.404 or 405. There are many studies that involve circumstances that require revision to the standard language, for example, studies that include both parents as subjects or only adults. The signature pages below can be used to substitute for the standard signature page for studies where the participants differ from the most common scenarios. The person obtaining consent signs and dates the consent form documenting that the consent discussion took place. If consent will be documented in the study record or by some other method, it is not necessary to include the Documentation page. When using a Short Form Consent process for non-English speaking subjects, the Study Summary document replaces the standard consent form. There are two differences: (1) title changes to "Study Summary Document" and (2) there is a different signature page which is signed by the member of the investigative team obtaining consent and the witness instead of the subject (or parent of the subject). The current versions of the CHOP informed consent templates are compliant with the FDA's new required statement for clinical trials. This statement is only required when there is an FDA requirement for trial registration on clinicaltrials.gov (see box below). This new requirement applies to all new and revised consent forms subject to FDA regulations and reporting requirements as of March 7, 2011. A description of this clinical trial will be available on http://www.ClinicalTrials.gov, as required by U.S. Law. This Web site will not include information that can identify you. At most, the Web site will include a summary of the results. You can search this Web site at any time.